The sample contains a circular plasmid DNA pUC19 and a filamentous bacteriophage M13. pUC19 is one of the most widely used vector molecules and has a 2686 base pairs double stranded DNA. The expected contour length of the plasmid molecule is 800 nanometers. M13 is widely used in phage display technology as well as in nanotechnology. The expected contour length of the bacteriophage is ~900 nanometers. Structures are uniformly distributed on the surface with molecule density 4-6 molecules/µm2. 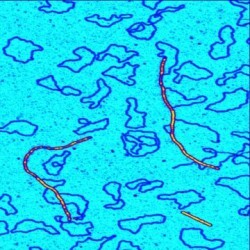 Example of AFM topography obtained on BS01 sample is shown below. Probe Etalon HA_NC has been used for the measurements.